Oh, you know me, I love a flourish. Sometimes it’s a rose crown on a bundt cake or a ruffle of gossamer apples topping a tart or maybe, just maybe a crazy swirl of toasted meringue on anything! But, sometimes simple is best. A summer snack at the lake, a slice of cake in a lunchbox or a midnight treat with a glass of milk. Those are the cakes we’ll make at the last minute, after a long day of work, just because we want a treat and cake makes everything good. Odette Williams wrote Simple Cake , a book about those cakes; the simple ones that are pure joy. Her book is filled with lots of delicious cakes and simple toppings that are great for a special occasion, but just as good if nothing in particular is going on. This simple chocolate cake is elegant and warm and makes me want to eat all the cake. I baked Odette’s Simple Chocolate Cake in a pullman pan, because I like the clean shape of the slices. I combined two of the whipped cream flavors she suggested for the cake to create a Vietnamese coffee cream, which was just the right balance of sweet and bitter. I went at the cake with a giant star tipped piping bag and then backed away and realized it needed something quiet and sleek. I just spread the whipped cream over the cake and smoothed the edges. I’m in love with this cake, it calms me. The dusting of cocoa was for drama (I just can’t help myself) and more contrast of flavor. For Mother’s Day (and Valentine’s Day) I always bake something I’d like my beloved children to bake for me, as a not-so-subtle hint to them. This website is basically a reference for my boys to use whenever they are looking for ideas of what to make me. (If only they ever read my blog!) I think Angel Food is perfect. The name alone is fitting for us moms, considering what we do to keep our darling children alive, well fed and mostly happy. I received a lovely new cookbook yesterday and it fell open to the angel food cake recipe. Jessie Sheehan’s The Vintage Baker is a wonderful book, full of classic desserts with her twist on them. 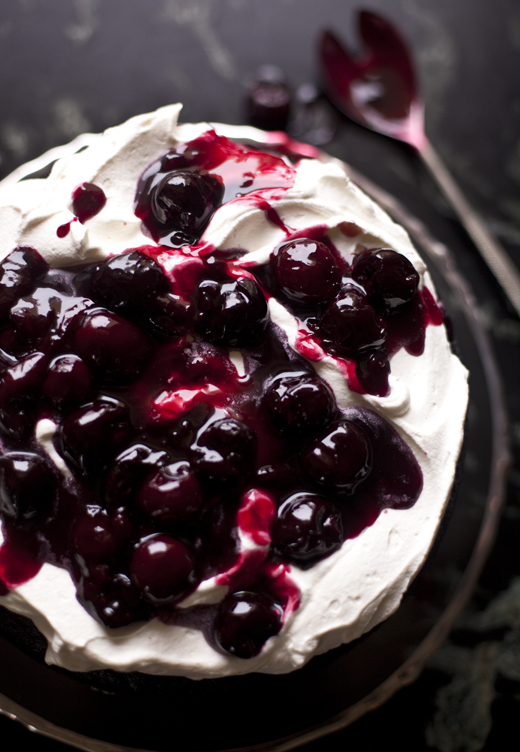 She made the perfect angel food cake, split it in half, then filled and topped it with a beautiful blueberry whipped cream. It really is a dream. I was completely smitten. I didn’t have any blueberries, but did have raspberries. Here in MN we’re just hitting spring and the very start of a growing season, so I rely on Driscoll’s to deliver perfect CA berries. I need the bright color and dose of summer. Tres Leches Cake is a light sponge cake that is soaked with three kinds of milk: sweetened condensed, evaporated and heavy cream (milk-ish enough to count), hence the name. Today is Cinco de Mayo and this cake seemed just the thing to celebrate with. It’s a rather simple cake, both in it’s presentation and in the making of it. Just bake a sheet cake, soak it and cover in whipped cream. I added a layer of cinnamon for the intensity of flavor and because I like how it looks. The recipe is from the newest cookbook by the America’s Test Kitchen folks, The Perfect Cake . As is suggested in their name, they test the living day lights out of every recipe they print, so I always trust they will work. The book is filled with the how’s and why’s of baking cakes, so you understand what you are up to while baking. You know how I love a good tutorial on baking, so this is right up my alley. It’s a great book and covers all the basics of cake baking. The only place I went off script was in the whipped cream topping. I had a little bit of homemade creme fraiche left over from my Pot de Creme, so I added it to the whipping cream and made a slightly more decadent topping. I also wanted a slightly thicker layer of the cream, so the creme fraiche stretched it for me. Then I dusted with cinnamon, which is not required, but it’s delicious. To watch me make the tres leches cake, check out my instagram video. Recipe is below. GIVEAWAY: The America’s Test Kitchen said I could give away a copy of their wonderful book to my readers, so I am going to do just that. Leave me a comment below about your favorite cake and you will be entered to win. The giveaway is limited to the USA only. Springtime Fool! What to do with all that rhubarb. It is officially spring when I walk outside my door and there are stalks of rhubarb standing tall in my garden. To date rhubarb and strawberries are the only edible things I’ve managed to grow. Every year the rabbits and squirrels wait until the strawberries are perfectly formed and just about to turn red, then they systematically eat them all. So, in the end all I am left with is my huge patch of rhubarb. It may be why I love it so much, because I feel a sense of accomplishment.